For returning state qualifiers senior Zach Rahnavardi and sophomore Cassy Herkelman their dreams of going to back to State are the goal they hope with be contagious for the whole team. Working hard and maintaining a positive attitude are a few of the ways Rahnavardi plan on getting there. For Herkelman, she hasn’t stopped practicing since last year’s season and will continue to work her hardest to make it to State. “This year we hope that Cassy works as hard as last year and can do as well as last year. She has a goal now to be the first girl to get a medal and be on the podium in Wells Fargo Arena,” parents Bill and Michelle Herkelman said. For two months athletes and their families spend every Thursday night and Saturdays together. This is one of the reasons why wrestler families seem so close-nit. “We understand the worry, the stress and the excitement that the other parent is feeling, whether the son/daughter is on varsity or JV,” parent of wrestler Mary Hess said. All of the parents cheer on the whole CF wrestling team, but they can do it one athlete at a time.Essentially each athlete gets his or her shining moment. “Yes we cheer on the whole team, but we do it one athlete at a time,” Hess said. Just like Hess, the Herkelman’s feel a similar way. “Our favorite part of the sport is probably the way it is an individual sport but it is also a team sport. It is great to see people all pulling together to cheer each other’s kids on. We all have the same goal — to see out CF Tigers do well,” Herkelman’s said. As for the coaching staff, they are always giving positive encouragement to the athletes. “Coaches push you in practice and show you what your potential is,” Cassy Herkelman said. 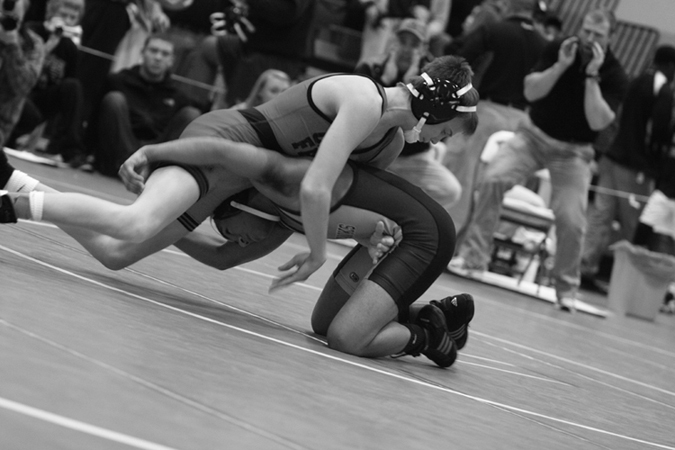 As a team, CF wrestlers won more matches than in previous years at the Keith Young Tournament on Saturday, Dec. 3. “We have a good core of seniors and returning letter winners this year. Throw in a good group of freshman, and I predict we will improve off of last year’s performance,” assistant coach Ethan Wiechmann said.